An Indian Kitchen is not complete without a good quality Pressure Cooker. There are many varieties of pressure cookers available such as stainless steel pressure cookers, aluminum pressure cookers, hard anodized pressure cookers, etc. Pressure cookers not only cut cooking time in half, but also help to retain vitamins and nutrients in your food. 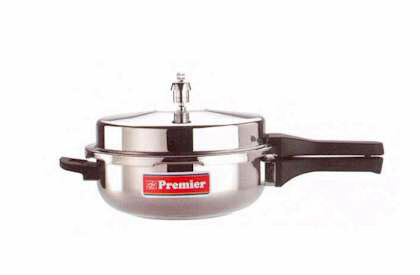 This Premier Stainless Steel pressure cooker pan is made from high-grade stainless steel with superior design features that ensure faster and more elegant cooking options. Add a pressure cooker to your kitchen ensemble today!